I knew it was coming. After all, we spent hours with not one but two separate children who subsequently came down with chicken pox two weeks ago. So when my almost four year old was thrown down on the couch and lethargic on Friday and Saturday, I thought he might be coming down with something. After all, as anyone who is familiar with three year olds knows, one thing they generally do not lack for is energy. On Sunday night, I found one angry looking red spot on his shoulder blade. I checked again at 7.30 on Monday morning and there was still just one spot. But by 9am when we were getting ready for preschool, there were ten. Chicken pox. We dutifully made our way to the local pharmacy to stockpile Calpol and Calamine lotion and then back home to wait for more spots to appear. In the meantime I asked friends who had already been through it for tips on how to deal with it. Everyone advocated bread soda or oatmeal baths to help dry the spots, so we’ve had one of those each day. A friend of mine, whose son recovered very quickly from his dose, delivered a bottle of “green stuff” to me. Apparently it is an antiseptic lotion that they use in Estonia to help dry the spots and prevent infection and prevent them spreading. It seems to be working because the original spots, which didn’t get this treatment when they first appeared, are very sore and swollen, whereas the others are much smaller. That being said, the others could very well be huge tomorrow! 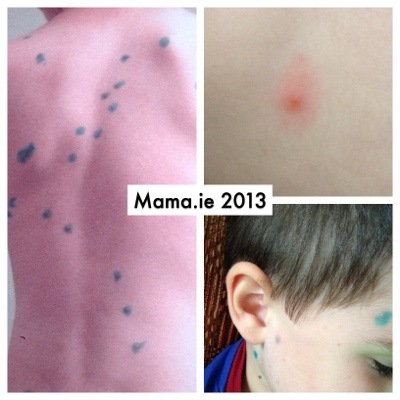 Several wise women from the Irish Parenting Bloggers group told me to go to the chemist for the “expensive chicken pox mousse”, so that’s what I sent Charlie there to ask for today. It’s called PoxClin and it seems to kill the itch. Get well soon little man! Hope little lady avoids it…. while they are a pain now at least once they are done they are gone! I certainly hope so Lucy! To be fair, he seems to have a mild dose thankfully Michelle, so he’s not as sick as some of his friends have been. Aaaaagh, I hated when mine had the chicken pox but I was happy they had them done and dusted (no consolation when Little Man is so sick). Hope Little Woman is OK and that you’re OK. Fingers crossed for a quick recovery. Aw, I love what Little Man said.